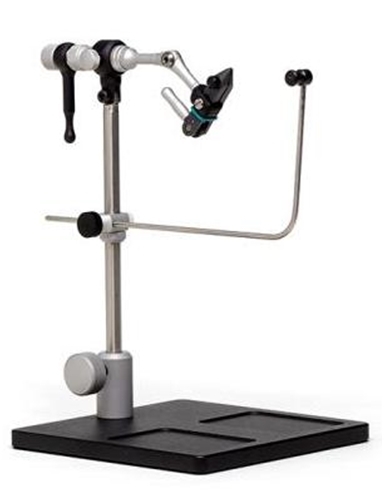 Renzetti Presentation 2000 Cam Vise is the latest of our vise selections. It won the Ka-Ching Award at the 2006 FlyFishing Retailer World Trade Expo. The Renzetti Presentation 2000 Cam Series Vises offers the tyer some of the best features of our vises at a very competitive price. Among the features are the Renzetti's patented adjustable jaw hinge and anti corrosion coated cam jaws, allowing the tyer to achieve True Rotary® action, a ratchet rotary actuator, adjustable bobbin cradle, a standard powder coated pedestal base, plus an adjustable hinge stem that allows you to tilt the vise head up or down adding comfort and versatility to your vise. In addition the Presentation 2000 is completely anodized for a more durable finish. This highly versatile Presentation 2000 is like no other vise and will quickly have you appreciating its beauty and features. The Presentation 2000 offers the jaws of a Presentation 4000, our patented hinged, just as the Master Series, a hinged stem. Made out of aluminun it comes with a std base, a bobbin cradle, a cracket rotaty actuator and a rotary tension screw. Folks searching for the word fly tying vises is often mispelled as fly tying vice or vices.